Instead of hiding his head in shame and apologizing to Ndi Anambra, Mr. Valentine Obienyem is now trying to claim the moral high ground as a result of Obi's camp's feeling that they have now adequately covered up the Governor's money laundry run of last Sunday. I have always warned them that despite stealing Anambra State blind in the last three and half years, this is one episode they will never get away with. Please Mr. Obienyem, this is a very serious matter. Lives are being lost daily in Anambra as law and order have now totally broken down under Peter Obi's misrule, while you and your boss seem to be having the time of your lives stockpiling our security vote every month. The blood of the innocently slaughtered in the state due to Obi's greed in stealing our security vote at the end of every month with the help of Ndibe Obi, will never let you get away with your financial crimes against Anambra State. While Peter Obi consistently fails to remember to pay our civil servants when due, he however never fails to remember to cart away our security vote on the last day of every month. Note that it was on the last day of last month that N250,000,000 was taken to his private office in Lagos from his office in Awka. 1. Remember that you Mr. Obienyem was booked to fly to Abuja with the 'Governor' on the evening of Sunday the 31st of May 2009 with Arik Air scheduled to leave Enugu airport at 3.30pm but both of you despite having confirmed tickets for that flight could not make it as a result of your presence in Lagos that afternoon. 2. Remember that the said owner of the N250,000,000 Mr. Ejike Onwusogbulu made an unscheduled flight that Sunday afternoon from Enugu airport with Gov. Peter Obi after the money had been intercepted in the premises of Next International in Apapa while Mr. Onwusogbulu was still in Awka and by then, knew nothing about the transaction. 3. Remember that the Dana flight was delayed for over 40 minutes while Mr. Obi and his team were standing at the tarmac sweating, as a result of the Governor not being booked to fly on that flight originally, the operators of Dana air had a problem allocating seats to Obi and his team namely; [a] Head of Convoy, the tall dark and lanky Officer Anthony Manya Ejike Onwusogbulu 'the now infamous car contractor' [c] Mr. Ifesi Solomon [d] the Governor's Chief Security Officer [a Yoruba officer who was not even dressed for the journey and was only told he was going to Lagos when he got to Enugu]. You should by now know that the Governor was properly monitored that Sunday. The picture evidence will be produced at the right time. 4. The Governor's friend Mr. Ifeanyi Ubah CEO Capital Oil and Gas Ltd., who could not get a seat on that Dana plane did beg Mr. Peter Obi to let him [Ubah] use his ticket since he was traveling alone without his aides while no seats were available for the Governor's aides whom the Governor could not travel without. Obi refused Mr. Ubah's request and eventually, the pilot released two extra seats to Mr. Obi and his team by getting air hostesses to seat in the cockpit with him. 5. Mr. Peter Obi sat in seat number 2a while Barrister Obika from Imo State sat in seat number 1a. Gov. Obi also traveled on that flight with his good friend Barrister Afam Ofomata [Ofomus] who helped him reclaim his cash filled suitcases upon their arrival in Lagos. I have taken my time in narrating Peter Obi's unscheduled movement to Lagos to rescue Mr. Obienyem and to sacrifice our N250,000,000 to the Lagos State Police Commisioner, I.G of Police Mr. Okiro [who retires next month and doesn't give a toss about Anambra State] and the Nigerian Guild of Editors who are now part of the conspiracy to cover up the scandal in the media. Narrating the above in details is now important because the government has now offered five different versions of what happened with the latest being that both Mr. Obienyem and Gov. Obi now claiming not being in Lagos last Sunday the 31st of May 2009. According to the new Commissioner for Information Chief Maja Umeh, published in the Guardian newspaper of today Saturday 6th June 2009; 'The Anambra State government has again distanced itself from the intercepted N250 million found in one of the vehicles on the governor's convoy in Lagos by the Police on Sunday. Commissioner for Information and Culture, Maja Umeh, noted that Governor Peter Obi was attending to official businesses in Abuja on Monday and Tuesday when the news broke. Umeh stressed that Obi was not in Lagos. The commissioner surmised that the owner of the money hitchhiked the three-car convoy, which went to Lagos for routine maintenance servicing. Umeh argued that joining the convoy was strictly the man's personal decision, which he could have worked out in private with the convoy's drivers. The state government has no hands in it." 6. The said 'contractor', Mr. Ejike Onwusogbulu was not in the car that took the money to Lagos therefore did not “hitch hike the three-car Governor's convoy”. He traveled with the Governor on Dana air after the Governor found out the money was intercepted. What is also very instructive is that Mr. Obienyem is now asked to deny that this 'contractor' is the brother in law of the Governor's younger brother, Ndibe. 'The Contractor' is merely a fall guy who has agreed to accept that the cash is his own. Lucky guy you would have thought? Forget it for he will never see one kobo of it. If Obi had been willing to give the guys that ferry the loot monthly just one percent of it, they would not have 'ratted' on him. Valentine Obienyem was in Lagos with Peter Obi whose only mission in town was to secure the release of those who were detained and to cover up the crime also. 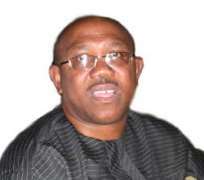 A government house source who wants to remain anonymous complained that the Governor's cars are always serviced monthly either in Lagos, Abuja or Port Harcourt, every month-end, depending on where Ndibe Obi is available to receive the monthly security vote from Awka. Two evenings ago, Peter Obi gave the entire members of Anambra State House of Assembly N60 million as 'Democracy Day' gift. Last night, Peter's Commissioner for Local Government and Chieftaincy Matters Mr. Dubem Obaze, went to the house of the Speaker of Anambra State House of Assembly Chief Anayo Nebe, holding a meeting with members of the House appointed to investigate this matter. Dubem left the Speaker's house much later without the 'Ghana must go back' he had entered with. Finally, Barrister Obele Chuka is just one of a very tiny minority of courageous Anambra citizens willing to pay the supreme prize in order to rescue our state from the evil clutches of an evil man with a severe split personality syndrome. Our Governor on one hand is a living Saint and on the other extreme, a psychopathic and murderous embezzler of state funds while swearing on his children's lives. Poor innocent kids! Obele Chuka deserves our prayers and support as he battles yet again, another satanic 'Governor' in Anambra State. When shall it be well with Anambra State? Mr. Obienyem over to you.